It was my first day in Brazil after the long nighttime bus ride back to our interior town. It had been a month since I had stepped on Brazilian soil. I opened the living room door and peer out into the yard. The light burned my eyes. Was the Brazilian sun always this bright? My eyes itched. I rubbed them. There was a haze in the air. I couldn’t see clearly to the other side of the valley. It took me a moment to realize that wasn’t my eyes, weakened by northern climates, it was the air itself. Every so often a wisp of cinders wafted by, lingering confetti from some strange, morbid party. 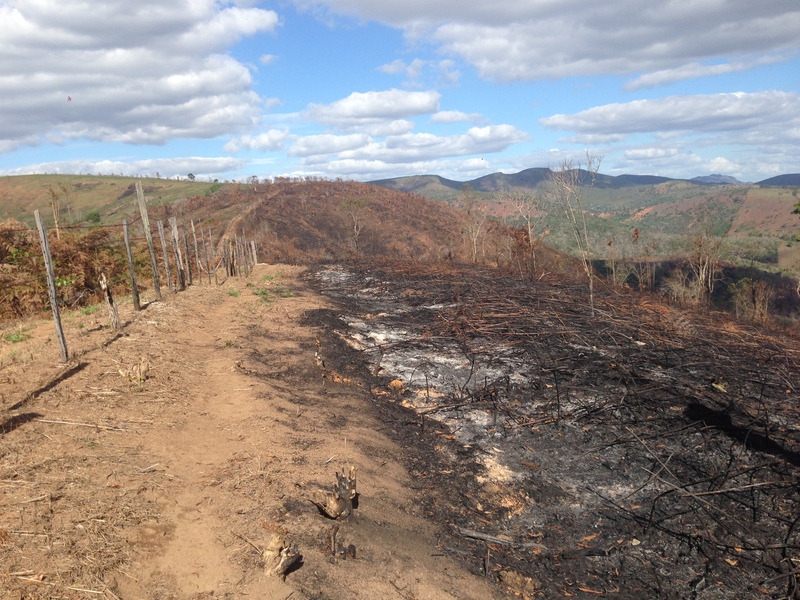 The dry season had come again, and the fires with it. Fire is an essential tool. Used in August, it beats back the jungle, destroying hard to cure brambles that would otherwise have to be treated with pesticides. It clears land quickly and renews it for new growth. We use it, as most farmers around here do. And then there are the fools who set fires in late September and early October, when the grass and trees are parched, the land starved for moisture, when a single spark or errant cigarette can start a blaze that will last for days. 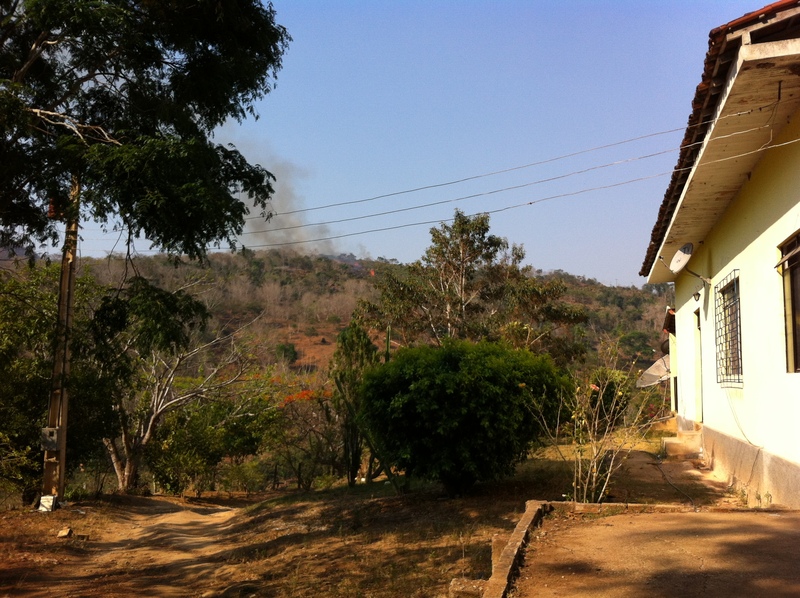 When we first arrived in Brazil the hills of Belo Horizonte were ablaze, wildfires dotting the mountaintops, sliding across ranges, clouds billowing towards our plane. It was awe-inspiring to see an arial view of the conflagration. It was unforgettable. “They burned the top of the farm.” My husband updated me while I was traveling, “It’s been burning for two days.” My mind saw an arial view of our home, fires sweeping across its crest. My heart sank into my stomach. Who set the fire? We don’t know. Was it a dirtbiker’s cigarette? Or a vandal? In either case, the callousness of the act leaves me gasping. Acres were burnt. A natural spring that watered four families depends on the green in that section of the valley. We wouldn’t know until later that year if the wandering band of monkeys that habit that intentionally wild part of the farm fled in time. After my return the top of the farm caught fire again, burning down even further into the valley. It burned for days, dying down, flaring up. 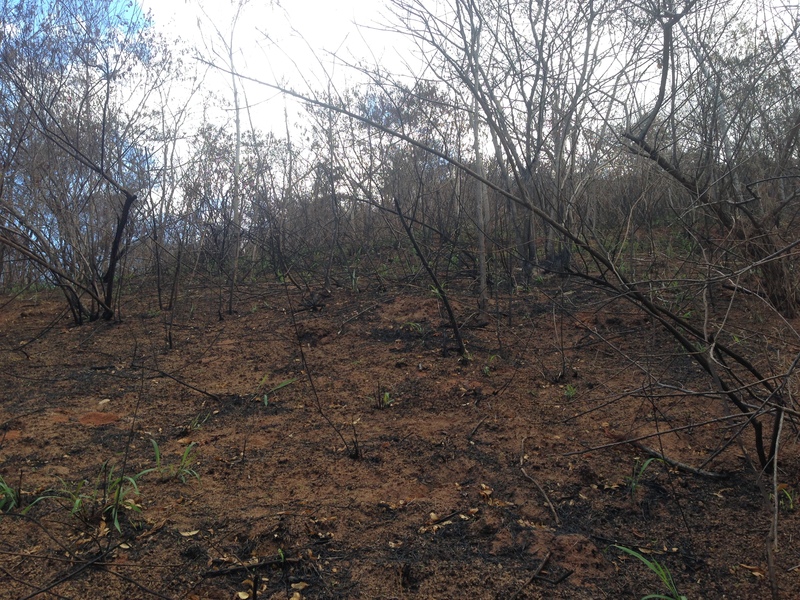 My husband and brother-in-law did battle with machetes, scythes, and hoes, clearing firebreaks wherever possible to slow its growth. They returned each day blackened and defeated. At night we eyed the oncoming fires warily through the darkness, marking the glow on the landscape, mentally counting the pastures consumed versus the tally of cattle to graze. Those were the fields that were supposed to get us through the winter. A week later smoke sprouted again at the other end of the valley, away from the fires. I quickly deposited my daughter in my sister-in-law’s care, and took off in long strides down our dirt road to get a better look. The last thing we needed was to lose the other pastures to a new blaze, as threadbare as those were. Two blazes. One was clearly intentional on a neighbor’s property, a pile of burning brush with nothing near it visible on the other wall of the valley. I sighed a breath of relief and continued walking to the gate. Across the road in the neighbor’s banana orchard, close to the margin of the road, another blaze raged. Banana palm leaves curled and waved in the heat. I pondered whether it was planned or accidental as I gauged prevailing winds and possibilities that it would jump the road to our fields. Safe, I decided, and turned back up the driveway. Now that the urgency had faded, I felt the scalding mid-day sun on my shoulders and the dry air in my mouth. Cinders drifted by me in the wind. Such is life when you live in a tinderbox. Glimmers of green among the char. Hope–and grass–spring eternal. Is it dry season for you right now? I am wondering because if it’s the case we are reversed here in Rondônia. The dry season here is from March to Sept, more or less. well, I’m a little late in publishing 🙂 Dry season–the worst of it–is usually Aug, Sept. Oct. I think we’re on a similar calendar. Rains usually are ending by April.